You will forgive me I know ….. I know I may have said a few things recently about how I wasn’t going to buy any more yarn or fabric as I already have enough and the craft room really needs sorting out as I have run out of storage so there are bags everywhere. 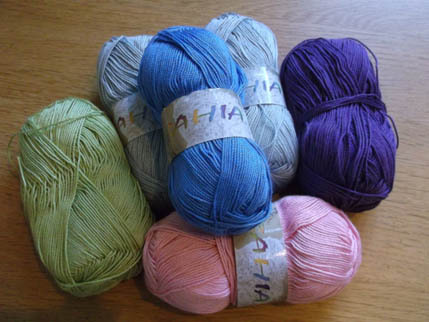 BUT when you see really lovely yarn and it is very cheap (2 Euros a ball which is about £1.70) and it would knit up wonderfully and there is a beautiful grey for more cute bunnies and some pretty colours for dresses as well then you just have to don’t you? So I did and here is my lovely new stash! 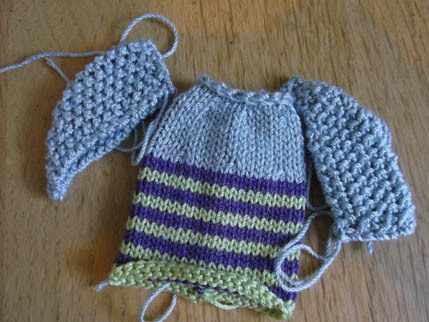 It is a very silky yarn – it is a double-knit but quite thin so the new bunnies are going to be smaller but it knits up really nicely, there is a slight sheen to it and it is very easy to work with. I have finally tried a bunny with striped tights, this is one for my sister-in-law for her birthday and she likes funky colours so I thought I would go brighter with this one.The picture below shows the body and ears. 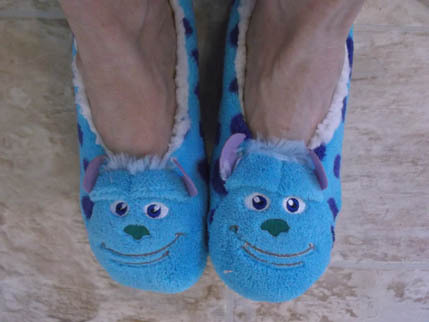 Oh and I got some fab new slippers while in Spain – I love Sully from Monsters Inc and they had these in the Primark in Elche, sadly only in children’s sizes but I managed to squeeze into a size 5. Am back in the swing of things again after what seems like a very long break from work 🙂 Can’t believe it is nearly the end of Jan already. Hope you are enjoying yourselves whatever you are doing and thanks for visiting. I agree, you can’t be expected to pass up a chance like that!